Installaatio menneisyyden talvista, talvi suomalaisena mieletilana. Neljän suomalaisen dokumentaariset tarinat talvesta, joka muutti heidän kohtalonsa. Ääni ja videoteos, elokuvateatteri, pienoisjuna. 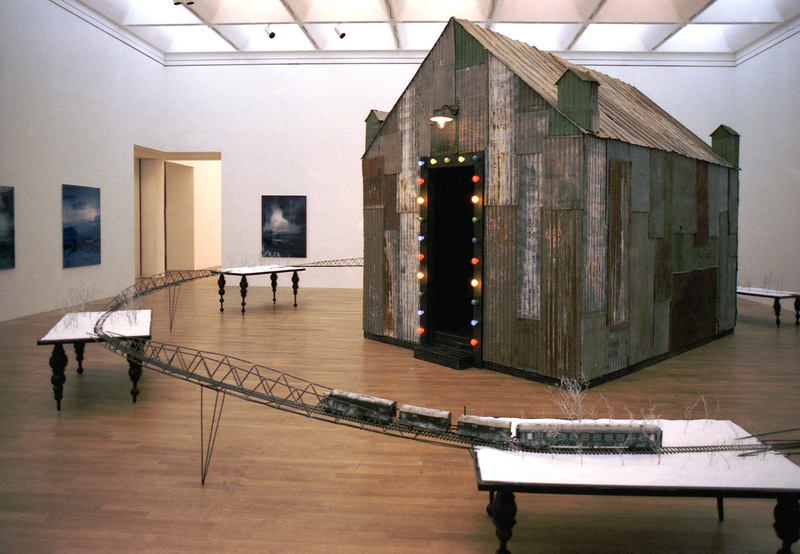 Islands (2004) is a site-specific installation in which a model train runs on a miniature railway round the exhibition space. Tiny video cameras inside the train record material which is presented in real-time in a building knocked together out of old corrugated iron. A sound loop simultaneously plays stories told by people from Pori, Finland about the most memorable moments of their lives. 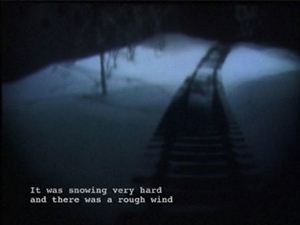 Islands creates a theatrical world of real-time and pre-produced material; the motion of the wheels of the train can be seen as a metaphor for the action of memory, continually conveying observations into the past and always coming back to where it started from. One feels it from the heart to the finger tips, one is still freezing, said the women. In her memory she is seven-years-old or perhaps thirteen, fourteen already and is rinsing the washing in an ice hole. Did it come from that – the paralysis? For the effects of the cold continue decades on, remaining in the depths of the soul. On the screen of memory a train moves back-wards. At Pohjankuru station the paralysed father is lifted onto the sleigh. Night is falling; the son sits next to the father, while the horse trudges through the snow towards the warm cabin. In spring the garden is covered in liverwort; the son takes a small water wheel to the stream. Not until August does the father die. Railway and cinema – both are achievements ofmodern technology. Both have changed human concepts of time and reality. Aside from that, they are both places from which one can tell stories very well. On a journey, a person is in an in-between space, one is either not yet or no longer tied to the routine of the everyday, not yet, or no longer reflected in the faces of familiar people. For instance a qharacter in a novel by the writer Marguerite Duras is reminded in such a way of a story, she heard on the night train, while travelling through two civil servants, who did not knoweach other, tell each other about their work, their life of night and of the cold. But Duras doesn’t recount the conversation ofthe men. Par more essential is the temporary commonality of the journey, the coincidence of the encounter, which makes all pretence unnecessary. In Veli Granö’s installation »Islands« tragic stirrings of the soul, the dialectic of remembering and forgetting are composed in reference to the process of travelling. A model railway circles a cinema, which is made of corrugated iron. 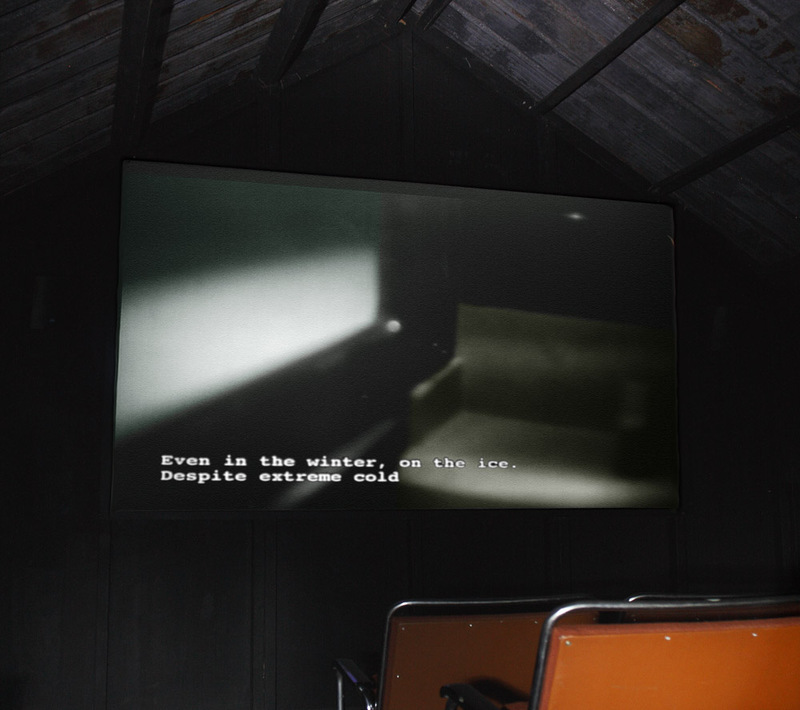 In the projection room four wintry tales are narrated, in real time, with the help of video cameras. In the darkness of the cinema, the border between reality and fiction, presence and absence is thus difficult to grasp. Through the camera perspective the model railway grows to the size of a real train. The train stops and continues again. The landscape behind becomes a continuum of images, a picture carpet – only the angle of vision changes from time to time. As a viewer, one asks oneself: Am I the traveller, train driver, listener to the story or its author? »Islands« was shown for the first time in 2004 at the large-scale group exhibition »Rien – is that everything« by Veli Granö and Tuovi Hippelainen at the art museum in Pori. Alongside photographs, video works and installations, numerous clay sculptures were on display, which were created during a self-portrait workshop which the artist couple held at an old people’s home in Pori. The work was entitled »Garden of Self«. The process of self-portraiture is also part of the story of the »Islands« installations: old people from Pori model clay and tell Granö their winter memories. On the following day these stories are recorded in the only intimate place in the old people’s home – its architecture standardises everything: on each individual’s own bed. In the final installation the stories of these unknown people are combined with those of Granö’s parents. The title »lslands« seems to underline the existential isolation of people, the fundamental loneliness and separation of the individual. On its circular route the train also crosses small snow-covered islands. Despite their common similarities, all islands are different; the table-like surfaces, which support them, have their own, and rhythms. Common denominators of the in stallations, film and photographic works of Granö can be the observation of the variety of existences, the astonishment in the face of life. Astonishment here means that one recognises the existential alienation of other humans, even if they trigger ternporary psychological teetering, such as surprising changes in our reality. One could say that man is bound to time, history and the surrounding social reality and that experience reality is always steeped in ideological bodies of thought – and with materialist rational thought, as well as by various metaphysical world views. Granö’s interest is in the unusual sides of existential experience. He has photographed people, who have managed to give their life meaning, people who have made self proclaimed art, or collect or build miniature models or those so-called »people of the stars« who believe in UFOs and have shaken the last remnants of any blind belief in science. Many of Granö’s works are created in cooperation with protagonists, or at least in exchange with them. Some of them have a documentary char-acter, others emphasise them beyond the identity of the people – and some times even change their social and societal identity. An early work of Granö, the photo series »Onnela« (»A Trip to Paradise«, 1986), reports on the visual world of the contemporary folk artist and presents them for the first time. In the meantime one can see the works of such »backyard Picassos« in foreign and Finnish art museums. People who were previously regarded as cranks are suddenly »do-it-yourself artists«, and have become masters of their self-created paths. How the individual experiences reality, is always linked to the capacity to view the exterior world as meaningful. The decay of values and social structure typical of the western world can increase the sense of insecurity and instability, but also break down hierarchies and promote the pluralism of society. 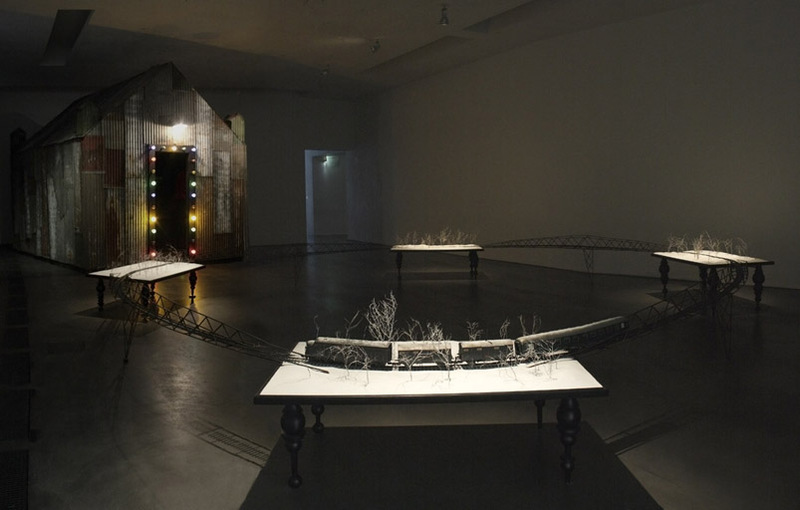 In the »Masters« series (2000-2006) he shows the passionate building of miniature models as a possibility to strengthen the sense of one’s own existence and to make contact with reality. For in that, there is a way to achieve meaning, classification and value systems, without resort to authority. The photos show a whole individual scheme of life and thereby criticise a one-dimensional human image. Moreover they portray a postmodern world in which cut and dried answers are longer available. In the »Islands« installation the stories are intricately bound to economic and social realifies. This is the case regarding the fates ofthe so-called »people ofthe stars«, who are threatened by structural violence. Granö has illustrated this fate in his film »Meet you in Finland Angel«. In a certain way Granö examines the societal reality similar in those days to the German photographer August Sander, whereas he always succeeded to utgrow one dimensional classification. His works are always concerned with recognising and acknowledging the diversification in the encounters with the inner alien, we all have within us. And they also engage the common experience of meaning, in which, for example, the photographed and portrayed stand, as if conjoined in a Möbius strip. Many people, whom Granö has filmed or photographed over the recent period, believe, like the healer Kirsti, in the existence of another, metaphysical reality (»Kirsti« 2002, »Transit to the Invisible« 2003, »Purification« 2004). »Islands« breaks through the conventions of linear, filmic presentation and rings in the changes – the multi-dimensionalism of our experience of reality in memory. The small train, incessantly trundling alone its tracks, reveals the mechanics of illusion and shows how the illusory world of film is created. Allured by colourful lamps I enter the dark cinema in which words change into images. Upon leaving I am certain, I saw the curly lad Martti making his way through the snow somewhere near the tracks. Se tulee sydämiin ja sormiin, ihan vieläkin palelee, nainen sanoo. Hän on seitsemän vai sittenkin kolmetoista, ehkä neljätoistavuotias ja viruttaa pyykkejä avannossa. Siitäkö se johtui, halvaantuminen. Kylmä kurotti vuosikymmenten yli, jäi sielun syövereihin. Muistin valkokankaalla juna nytkähtää liikkeelle. Pohjankurun asemalla halvaantunut isä nostetaan rekeen. On jo hämärä. Poika istuu isän vieressä, kun hevonen tarpoo paksussa hangessa kohti lämmintä mökkiä. Keväällä sinivuokot täyttävät pihan ja poika panee rattaan puroon pyörimään. Isä kuolee vasta elokuussa. Juna ja elokuvateatteri ovat molemmat modernin teknologian tuotteita, jotka ovat muuttaneet ihmisten käsitystä ajasta ja todellisuudesta. Molemmat ovat myöskin otollisia tarinan kerronnan paikkoja. Matkalla ihminen on välitilassa, ei vielä tai ei enää kiinni arjen rutiineissa, tuttujen ihmisten kasvoissa. Kirjailija Marguerite Duras panee erään romaanihenkilönsä muistelemaan tarinaa, jonka tämä oli kuullut Siperian halki kulkevassa yöjunassa. Kaksi toisilleen vierasta virkamiestä kertomassa työstään, elämästään, yöstä ja kylmyydestä. Duras ei toista miesten puheita. Oleellista on matkustamisen tuoma hetkellinen yhteisyys, kohtaamisen satunnaisuus, joka tekee teeskentelyn tarpeettomaksi. Veli Granön Saaret -installaatiossa mielen traaginen liike, muistamisen ja unohtamisen dialektiikka rinnastuu konkreettiseen matkantekoon. Pienoisjuna kiertää ruostuneesta aaltopellistä kyhättyä elokuvateatteria, jossa neljä talvista tarinaa limittyvät äänimaisemaan ja junaan asennettujen videokameroiden välittämään reaaliaikaiseen kuvaan. Elokuvateatterin pimeydessä raja toden ja epätoden, läsnäolon ja poissaolon välillä muuttuu mutkikkaaksi. Kamera kasvattaa pienoismallin ”todellisen” junan mittoihin. Juna pysähtyy, jatkaa taas matkaa. Maisema ikkunoiden takana muodostaa jatkuvaa kuvamattoa, mutta aika ajoin näkökulma vaihtuu. Olenko matkustaja vai junan kuljettaja, tarinan kuulija vai sen rakentaja? Saaret oli ensi kertaa esillä Veli Granön ja hänen vaimonsa, Tuovi Hippeläisen laajassa yhteisnäyttelyssä Rien – siinäkö kaikki ? (Porin taidemuseo, 2004). Valokuvien, videoteosten ja installaatioiden lisäksi näyttelyssä oli mukana satoja pieniä saviveistoksia, joista osa oli syntynyt taiteilijapariskunnan vetämässä omakuvatyöpajassa. Työn nimi oli Minuuden puutarha, Garden of Self . Tämä minäkuvan työstämisen prosessi synnytti myös Saaret -installaation tarinat: porilaiset vanhukset muovasivat savea ja kertoivat Granölle talveen liittyviä muistojaan. Nauhalle ne tallennettiin seuraavana päivänä – arkkitehtuurillaan yhdenmukaistavan vanhainkodin ainoassa intiimissä paikassa, omalla sängyllä istuen. Lopullisessa installaatiossa tuntemattomien ihmisten tarinat limittyvät tekijän omien vanhempien kertomuksiin. Nimenä Saaret tuntuu alleviivaavan ihmisen eksistentiaalisen erillisyyden tuntua, yksilön perimmäistä yksinäisyyttä tai partikulaarisuutta. Juna kulkee ympyränmuotoisella radallaan, halkoo lehdettömien puiden reunustamat lumiset saarekkeet. Näennäisestä samankaltaisuudestaan huolimatta ne ovat kaikki erilaisia, niitä kannattelevilla pöytämäisillä tasoilla on kaikilla oma rytminsä, oma ominaislaatunsa. Granön installaatioiden, elokuvien ja valokuvateosten yhteinen nimittäjä voisikin olla olemassaolon moninaisuuden tutkailu, ihmettely elämän edessä. Ihmettely tarkoittaa toisen perimmäisen outouden tunnustamista, arvaamattomien todellisuuden palasten aiheuttamaa hetkellistä psyykkistä heilahdusta. Voidaan väittää, että ihminen on aina sidottu aikaan, historiaan ja ympäröivään sosiaaliseen todellisuuteen, ja että todellisuuden kokemus on aina ideologisen fantasian läpitunkemaa. Tämä pätee niin materialistis-rationaaliseen ajatteluun kuin erilaisiin metafyysisiin maailmanselityksiin. Granön kiinnostuksen kohteena ovat eksistentiaalisen kokemuksen epätavallisemmat puolet. Hän on kuvannut ihmisiä, jotka ovat onnistuneet antamaan elämälleen merkityksen omaehtoisen taiteen, keräilyn ja pienoismallien rakentamisen avulla – tai ufo-kokemuksiin uskovien ”tähteläisten” tavoin riisuneet yltään viimeisetkin tieteisuskon riekaleet. Monet Granön teoksista ovat syntyneet yhteistyössä tai ainakin tiiviissä vuorovaikutuksessa kuvattavien kanssa, heidän maailmojensa ehdolla. Ne eivät vain dokumentoi kohteitaan, vaan voimistavat ihmisten identiteettiä – toisinaan jopa muutattavat heidän sosiaalista ja yhteiskunnallista asemaansa. Granön varhaistuotantoon kuulunut valokuvasarja Onnela (1986) kertoi nykykansantaiteilijoiden hulvattomasta visuaalisesta maailmasta, teki sen ensimmäistä kertaa näkyväksi. Nyt näiden takapihojen picassojen teoksia näkee niin suomalaisissa kuin ulkomaisissakin taidemuseoissa. Aikaisemmin kummajaisina pidetyt tekijät ovat yhtäkkiä muuttuneet ITE-taiteilijoiksi (DIY-artist), Itse Tehdyn Elämän mestareiksi. Yksilön kokemus todellisuudesta on aina sidoksissa hänen mahdollisuuksiinsa nähdä ulkomaailma mielekkäänä. Länsimaiselle yhteiskunnalle tyypillinen arvojen ja sosiaalisten rakenteiden pirstaloituminen voi merkitä epävarmuuden lisääntymistä ja perustattomuuden tunnetta, mutta myös hierarkioiden murtumista ja yhteiskunnan monikasvoistumista. Masters -sarjassa (2000-06) intohimoinen pienoismallien rakentaminen näyttäytyy tapana vahvistaa olemassaolon tunnetta, jäsentää todellisuutta ja luoda auktoriteeteista riippumattomia merkitysten, luokitusten ja arvojen järjestelmiä. Valokuvat kertovat yksittäisistä elämänkohtaloista ja kritisoivat yksiulotteista ihmiskuvaa, mutta kuvaavat hyvin myös jälkimodernia maailmaa, jossa valmiita vastauksia ei enää ole. Saaret -installaatiossa tarinat kietoutuvat tiukasti yhteen taloudellisten ja sosiaalisten realiteettien kanssa niin kuin rakenteellisen väkivallan riepomien ”tähteläistenkin” kohtalo, jota Granö on kuvannut mm. elokuvassaan Meet You in Finland Angel (2003). Voisi oikeastaan väittää, että Granö katselee yhteiskunnallista todellisuutta yksilöiden kautta hiukan samaan tapaan kuin saksalainen valokuvaaja August Sander aikoinaan, mutta pystyy silti ylittämään yksiulotteisen tyypittelyn. Hänen teoksissaan kyse on erilaisuuden tunnistamisesta, meille kaikille ominaisen sisäisen muukalaisuuden kohtaamisesta. Tai jaetusta merkityksellisyyden kokemuksesta, jonka aikana kuvaaja ja kuvattava kietoutuvat toisiinsa kuin Möbiuksen nauhalla sidottuina. Henkiparantajan taitoja omaavan Kirstin tavoin monet Granön viime aikoina videoinstallaatioissaan kuvaamat ihmiset uskovat metafyysisen todellisuuden olemassaoloon ( Kirsti 2002, Transit to the Invisible 2003, Purification 2004). Saaret purkaa elokuvakerronnan yksiviivaisia esityskonventioita, mutta muistuttaa myös todellisuuskokemuksen häilyvästä moniulotteisuudesta. Radallaan vakaasti kiertävä pienoisjuna kameroineen paljastaa illuusioiden luomisen mekaniikan, näyttää, kuinka elokuvan lumemaailma syntyy. Moniväristen valojen houkuttelemana astun pimeään teatteriin, jossa sanat muuttuvat kuviksi. Poistuessani näyttelystä olen varma, että olen nähnyt kuinka kiharapäinen Martti-poika puskee tuiskussa vasten tuulta, jossain ratapenkan tietämissä. Inside of the theater house. Subtitles for live video projection. Martti stayed by the factory gates. It was my mother’s sister. 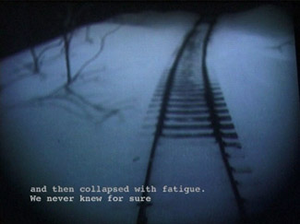 and then collapsed with fatigue. My hands did get used to it. My hands stung with the cold. Did that cause the paralysis? Even in the winter, on the ice. Young and old joined in. We had nothing. No food. We even used the jawbones. A horseman came to meet us. All of us climbed on the sleigh.